Over 40 years ago, people were alarmed by large numbers of roadkill or “splats” on Switzerland’s highways and started building tunnels for amphibians. Through trial and error, Europeans, the British, and more recently, North Americans have been coaxing frogs and salamanders to go under roads rather than over them. It turns out that some species readily move through culverts and tunnels while others do not. The reasons vary. German biologist Ulrich Sinsch discovered that newts use aboveground landmarks and celestial cues to find their way around forest and fields. Going underground through a tunnel could be very disorienting. Cold-blooded amphibians are sensitive to temperature. They become dormant when it gets cold. British biologist Rob Oldham showed that toads were reluctant to move through tunnels that were colder than above ground temperatures. It is possible to make tunnels less disorienting and the same temperature as the surroundings. In fact, people who have reviewed tunnels around the world suggest that large sizes (minimum 1 m in diameter) let in lots of light and airflow and work best for most species. Other important design features include diverting runoff to prevent water from flowing though the tunnel, moist natural soil substrates, and straight walls easy for frogs to follow. Our goal is to build a tunnel that meets all the recommendations learned from past projects and fits within the roadbed at the peak amphibian crossing point on Highway 4. Road surveyors measured the height of the road last spring. It’s a shallow roadbed with the road surface only 60 cm higher than the normal water level in the ditches. This limits the options for installing a large enough tunnel. We reviewed a variety of prefabricated tunnels/culverts available in B.C. We looked at both open-bottom metal culverts and concrete box tunnels. By far the best option for size and straight walls is a concrete box tunnel, 1.8 m wide by 0.9 m tall (interior dimensions). Safety standards require at least 22.5 cm of cover and 5 cm of asphalt over top of the culvert. This means we will have to dig the culvert into the ground and fill it with substrate to the height of the water level. The end result will be a tunnel that is .42 m tall. That’s taller than most Red-legged frogs jump. We hope the large width will compensate for the lack of height in letting in adequate light and air circulation. We are working with the Ministry of Transportation to plan the installation of the experimental tunnel this winter. We will spend next year testing how well it works. Fingers crossed. Our purpose is to promote awareness and stewardship of wetland ecosystems and their connections to surrounding lands and waters. Our blogs help us share what we're learning about how to monitor and mitigate threats to amphibians at all stages of their life cycle. Most of our focus is on protecting habitat for breeding, foraging, overwintering, dispersal and migration. We are keen to provide links to information from similar projects elsewhere. Please email us "wetlandstewards at gmail dot com" with your link. 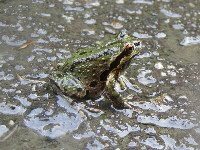 Why did the Red-legged Frog cross the road?